U.S. Rep. Beto O'Rourke, D-El Paso, the Democratic candidate for U.S. Senate, shakes hands with supporters before speaking at a campaign stop at The Social Club on Sunday, Sept. 23, 2018, in Edinburg. McALLEN — Just a few weeks after holding a 2,000-person rally in Edinburg, Democratic Senate candidate Beto O’Rourke will be at the McAllen Convention Center on Oct. 13 with U.S. Rep. Joe Kennedy III for what is expected to be O’Rourke’s largest Rio Grande Valley event. Days later, on Oct. 18, O’Rourke will be back in the Valley for a CNN town hall. On Oct. 22, early voting begins. Those three campaign events, in addition to a Brownsville rally the same day O’Rourke was in Edinburg, mark four Valley campaign stops within a month leading up to early voting. U.S. Sen. Ted Cruz, R-TX, meanwhile, has held one campaign event in the Valley since the March primary. In April, the National Border Patrol Council, the 18,000-member labor union for Border Patrol agents, endorsed Cruz at its RGV headquarters in Edinburg. Cruz advertisements have been airing on local broadcasts and more Cruz yard signs have been ordered by Valley residents, but the candidate has not appeared in the region since he made an emergency visit in his official capacity as a senator. In June, when President Trump’s policy of separating immigrant families was in full effect, Cruz and his Texas Republican counterpart, U.S. Sen. John Cornyn, visited an immigration detention center in Brownsville. 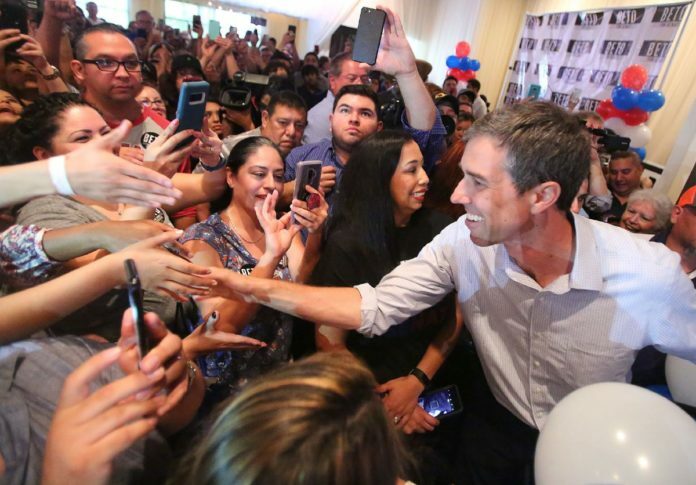 For O’Rourke, South Texas has been an emphasis since he began campaigning in 2017. He’s visited the Valley more than seven times since he began driving around the state last year considering a run for senate, and by the time Election Day comes around, O’Rourke will have visited on about 10 occasions. This will be Kennedy’s first time campaigning for O’Rourke in the Valley, but not his inaugural trip to Texas this cycle. Kennedy campaigned in March with O’Rourke in Houston. The two also appeared at a march in Tornillo, the West Texas town where tents have been built to house more than 1,000 immigrant children. Kennedy will also be with O’Rourke in Corpus Christi on the morning of Oct. 13 before the two drive to McAllen.